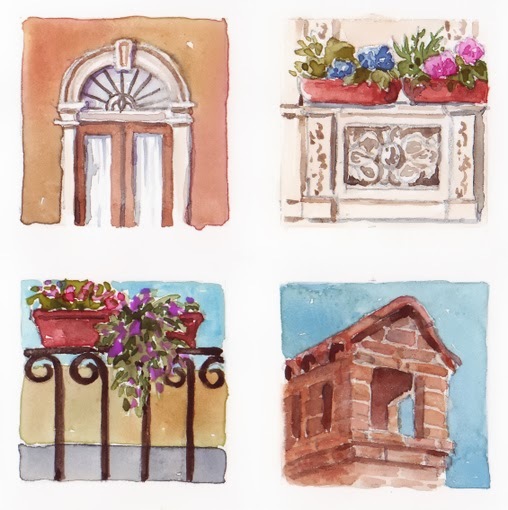 Shutters, flowers, balconies, iron gates...interesting and beautiful little scenes were everywhere in Italy. It was a feast for my eyes and spirit. 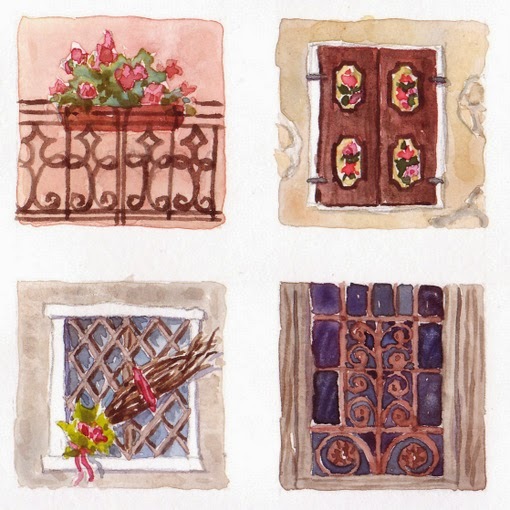 10" x 7", pencil & watercolor, Stillman & Birn Beta series sketchbook. 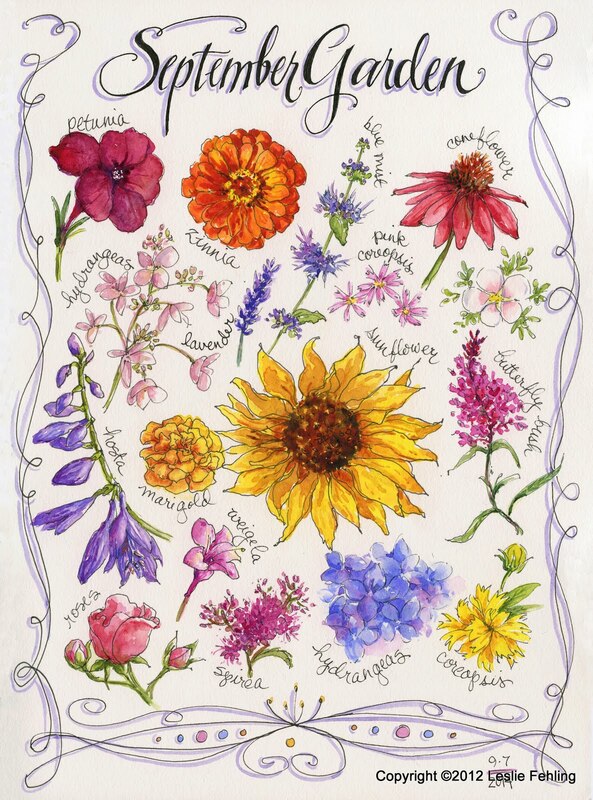 Each small sketch is 1-1/2"x 1-1/2". I pretty much walked around in a constant state of wonder while I was there. I can't even begin to count the number of times I said to my traveling companion, Suzie, "Oh! Look at that! It's so-o-o-o beautiful!!!!" 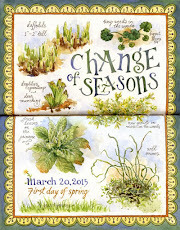 Finally, I decided to make a page in my journal that would feature a few of these little vignettes. 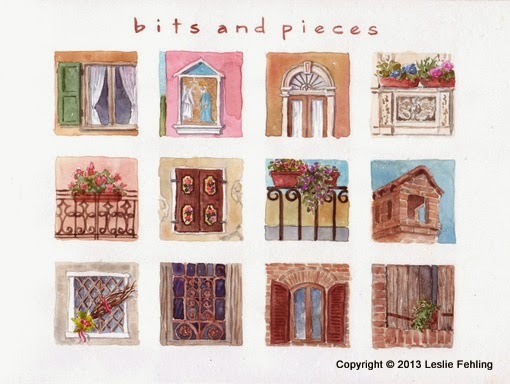 I marked off 1-1/2" squares in pencil, and began filling them in one-by-one as we traveled. Since the squares were so small, I didn't use ink lines, as I thought they would overwhelm the tiny pictures. Just a few lines in pencil were enough to remember the essentials of a scene, then I painted them back home in my studio. We found beauty in the most unlikely of places, like the scene above. Someone took the time to tie bundles of twigs with colored twine, twist tissue paper around a few primrose plants, tie them with ribbons, and place the arrangements on each windowsill of an ancient house in a small out-of-the-way village. Was it for the tourists? For the neighbors? For people driving or walking by? 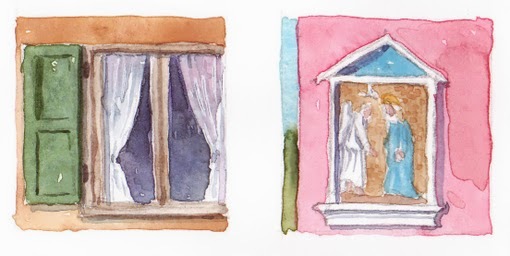 Or did she do it just for herself, for the love of seeing something beautiful at every window in her home? 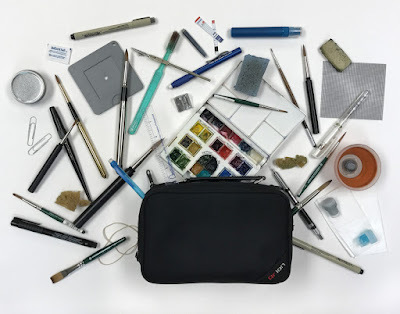 An Italian everyday artist! 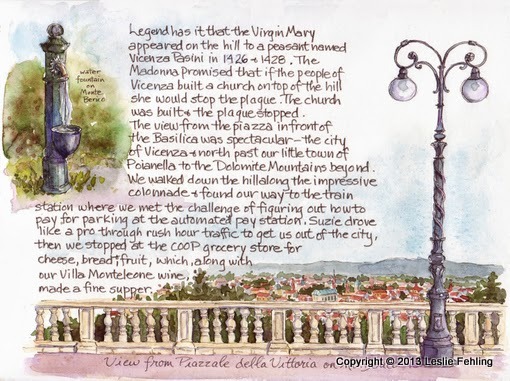 After touring the city proper, we climbed the 235 stone steps to the top of Monte Berico, where we rested in the peace and quiet splendor of the 15th century Basilica of St. Mary. The panoramic view from the esplanade in front of the church showed us Vicenza from another perspective. It was fun seeing where we had walked and the places we had seen earlier in the day. There are beautiful lamp posts all over Italy, in an endless variety of ornate styles. Here, I used the ones on the piazza on Mt. Berico to frame the view and offer a vertical contrast to the wide horizontal balustrade in my sketch. I masked off the balusters using masking fluid, then painted the greenery and the city. After everything dried, I removed the masking and added a glaze of yellow ochre mixed with burnt sienna to the balusters, to hint at the warm color of the marble. Grey-blue shadows finish things off. As I'm writing this, I realize that I made a mistake on this sketch. Can you see it? I have two different light sources! In the foreground, the sun is shining from the right, and in the city it's from the left. That's what happens when I dash into my studio and paint for a few minutes, then have to run off and do something else - I lose my focus. (Would you have noticed, if I hadn't pointed it out?) Oh well, it's just a sketch! 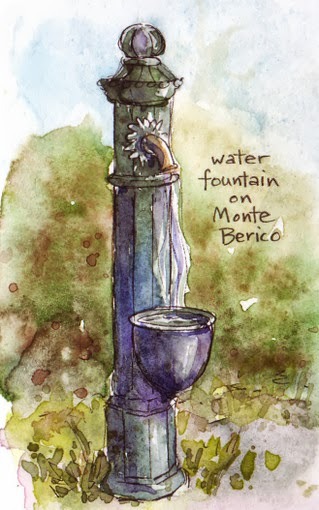 Just down the street from the cathedral, I spied this simple, yet beautiful, old water fountain, one of many I saw around the city. The text I added in red tells the story. 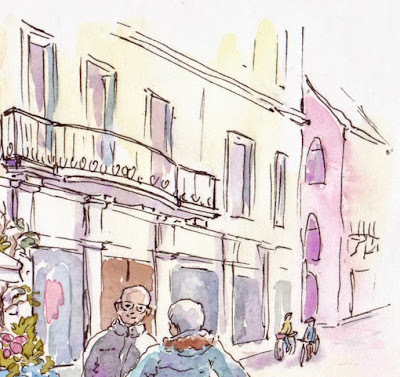 Suzie and I had the most pleasant conversation, if you can call it that, with this sweet older man near the main square in Vicenza, where we sat sketching. He spoke only Italian, and we spoke only English, but do you think he let that stop him? No way! He smiled and gestured, to let us know he liked our sketches. We smiled back, trying very hard to understand the torrent of Italian coming at us, but I'm afraid we weren't too successful. 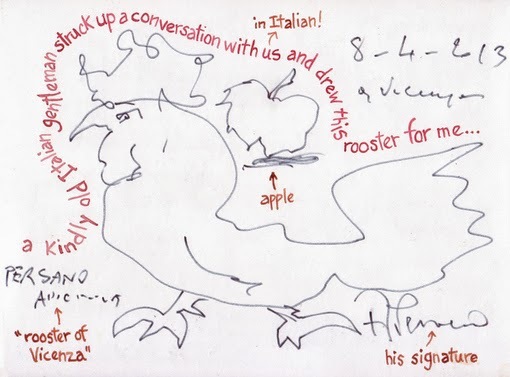 Undaunted, he then offered to draw something for us in our sketchbooks, first a rooster, then a rather scraggly apple. He proudly signed his name with a flourish. Oh, that I had that kind of confidence! It was a wonderful encounter, one of those unexpected gifts that come when you open yourself up to adventure. When I went on this trip, I made up my mind that I was going to experience as much as I could, even if I sometimes felt embarrassed or self-conscious. I had to step outside my comfort zone every day. If I wasn't willing to do that, I might as well stay home. So, I sketched in public (even when it made me uncomfortable), tried new foods (even though the sight of octopus on my plate was a little frightening! ), "talked" to Italians, both friendly and not (even though I could barely manage more than grazie & ciao), and somehow muddled my way through. Travel can be stressful, but it's oh, so worth it, and the things that challenge us end up being the most lasting, and sometimes the sweetest, memories. You know how it is when you're traveling... there's so much to see and do, and just not enough time. Throw some sketching into the mix, and things get even more challenging. 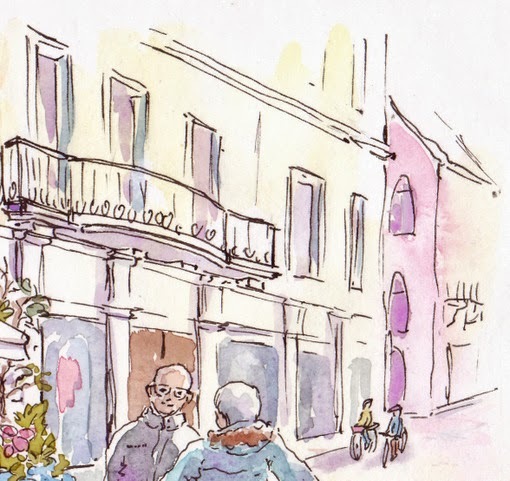 During my time in Italy, I had to make a conscious effort to not stress about what I wasn't seeing or sketching. Here and there in my sketchbook, I left blank pages, so I could go back later at home and add paintings of a few of the spots that were my favorites, but that I hadn't had time to sketch onsite. 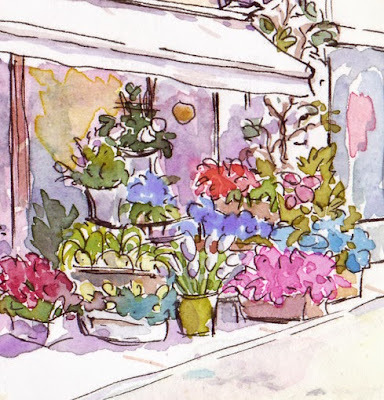 This flower shop sketch is one of those blank pages come to life. I tend to get very tight and detailed when I'm painting from a photo, and I really didn't want to do that with this pretty scene. The sight of all those gorgeous flowers in early April made my heart sing, and I wanted to give this sketch the same light, free, happy feeling I had that day in Vicenza. I thought it might be interesting for you to see the photo I took that day, and how I used artistic license to change things a bit for the painting, while remaining true to the spirit of the scene. Most obviously, there's the color. I decided to keep the whole thing high-key and colorful, so gray cobblestones and sidewalks morphed into blush pink and lavender. A black jacket was changed to light teal, and the golden yellow building was washed out by the bright sunshine in my sketch. I exaggerated the purplish hue that's often seen in shadows, and even pushed it to pink in places. I enlarged and centered the shop name to make it more prominent. Now, it announces "This is Italy!" Details on the foreground balconies and shops were simplified, and as I moved farther back in the picture, they became even less detailed. I even left out a building or two at the end of the block, because I thought the composition would benefit from having the contrasting pink building jutting out, to stop the eye from running off the page. I moved the shop window with the mannequin to the left of the double brown doors, so the doors would act as a frame for the man's head. 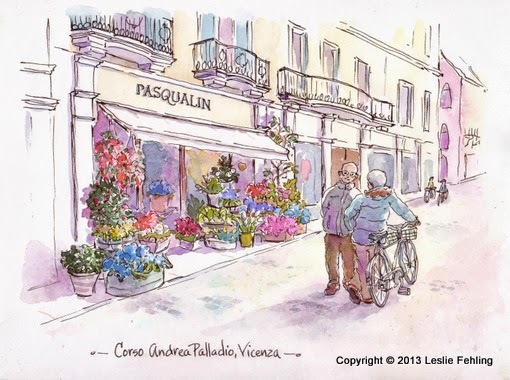 The arcing cobblestones, which were so beautiful on Andrea Palladio Street, looked odd when I sketched a few in pencil on my painting. They made the street look like it had little hills on it. I could have worked to get the perspective right, but, instead, decided to make it easy on myself and change them to square cobbles. Just a few here and there were enough to suggest the texture of the street. 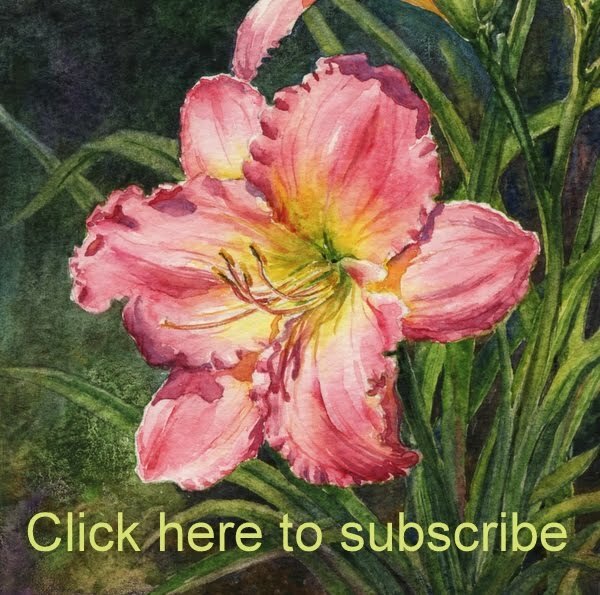 It would have been very easy to get caught up in the details when I painted all those flowers, but I constantly reminded myself not to get too fiddly with them. 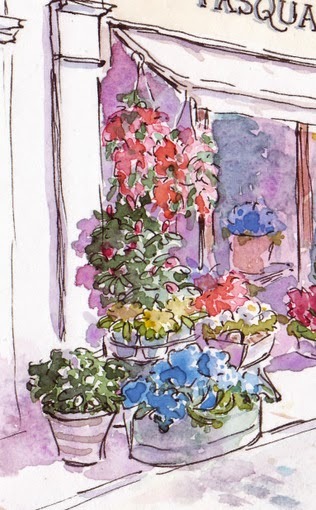 I did include most of the pots and containers that were in the photo, and their lovely blooms, but I tried to keep them as masses,with just enough detail to hint at a light and dark side and give them some depth. Notice that the colors on the flowers are much more intense than on the building or the street. That helps to draw attention to my intended focal point, the flower shop. The two gentlemen in the foreground are an important part of the scene, and I loved their relaxed stance, but I kept their colors a bit on the muted side, to make them secondary to the riot of color across the street. 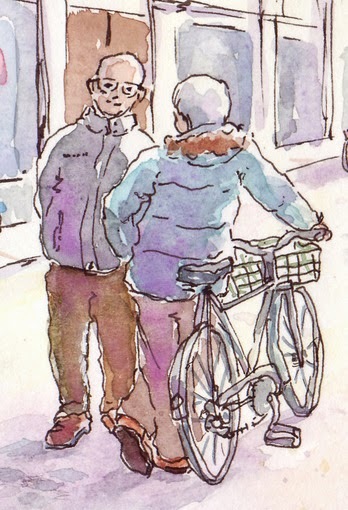 We saw scenes like this everywhere we traveled in Italy - older folks stopping with their bicycles to pass the time of day with a friend or acquaintance. There's something so charming about it. 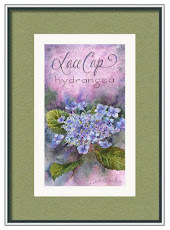 It speaks of friendship, relaxation, and a certain attitude toward life. So, that's the inside story of this page in my travel journal. I hope you'll let me know if you enjoyed it. I'll be happy to share more about future sketches, if you like. Also, would you enjoy seeing a post or two showing step-by-step photos of how a page/painting comes together?